The March issue of Wired Magazine carries an article titled: The Future of Money: It's Flexible, Frictionless and (Almost) Free. "The banks and credit card companies have spent 50 years building a proprietary, locked-down system that handles roughly $2 trillion in credit card transactions and another $1.3 trillion in debit card transactions every year. Until recently, vendors had little choice but to participate in this system, even though -- like a medieval toll road -- it is long and bumpy and full of intermediaries eager to take their cut. Take the common swipe. When a retailer initiates a transaction, the store's point-of-sale system provider -- the company that leases out the industrial-gray card reader to the merchant for a monthly fee -- registers the sale price and passes the information on to the store's bank. The bank records its fee and passes on the purchase information to the credit card company. The credit card company then takes its share, authorizes all the previous fees, and sends the information to the buyer's bank, which routes the remaining balance back to the store. All in all, it takes between 24 and 72 hours for the vendor to get any money, and along the way up to 3.5 percent of the sale has been siphoned away." Paypal, which at the time of its founding was intended to introduce an alternative to money, has become a web interface with the world's banking system and the credit card companies, simplifying transactions, but still using the same currencies that are in our wallets and in our bank accounts today. Third party applications that interface with Paypal like Twitpay, simplify that interface even more, allowing you to send money to someone's Paypal account by a simple tweet. Jack Dorsey's Square is another one of the payment alternatives discussed in Wired. It is a physical plug-in to smart phones that allows users to accept credit card payments without having to have a merchant account. Obopay, which runs on Nokia phones, is a mobile payment system that allows transfers from one mobile phone user to another. It interfaces with Mastercard, a few banks and some major mobile phone providers. Zong is another phone based mobile money transfer application, aiming to take a bite out of the credit card business, while GetGiving specializes in micro payments or small donations to charities. Those systems, as described in the Wired article, all interface with banks and "real" money. They merely seek to find a way around the immobility and clunkiness of the service provided by banks and credit card companies. For anyone advocating changes to the current monetary system, local currencies or an internet-based alternative to bank-issued money, the article may be a bit of a disappointment, because it is all about how to move money more efficiently and more cheaply than banks and credit card companies, rather than reforming the money system itself. Is this where we are heading? 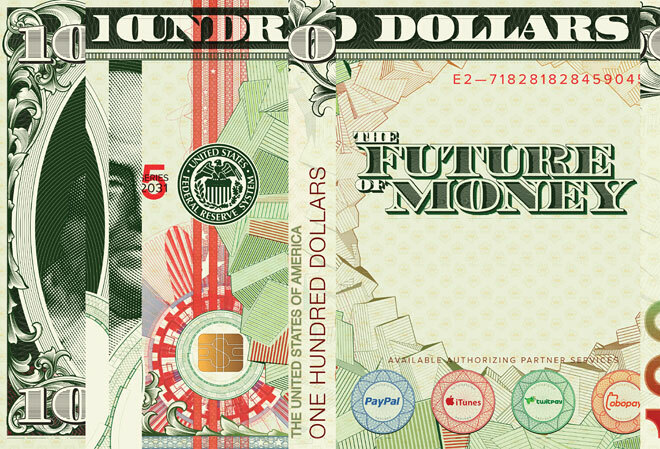 This may be the future of money, but some would disagree. Indeed a whole movement of currency activists has grown up that goes in a different direction. Community currencies seek to de-emphasize reliance on traditional money and to stimulate economic exchange by keeping track of debit and credit. One may argue that those systems are not ready for prime time yet, especially if the objective is to provide a viable alternative to current money. Community Currencies or LETS systems are run by mostly local groups using a non-money-based means of exchange to stimulate economic activity, but none of them have so far been able to provide for all or even a major part of the day-to-day economic exchange needs of their members. "The only other open source web 2.0 project in deployment is http://opensourcecurrency.org. Otherwise Cyclos is much more powerful but requires java, and is less configurable/themable. GETS is a business to business network but is closed-source and pricey for non-business networks. CES is a membership based scheme which means communities sacrifice a certain level of autonomy for use of the software." John Rogers at http://www.valueforpeople.co.uk/ is a long time community currency advocate with practical experience who is spreading the word through a series of web based seminars http://valueforpeople.co.uk/letsmakemoney explaining what has worked and what hasn't. He addresses people interested to organize a community to start using an alternative currency. "The most graceful and promising approach to empowering ourselves and our communities is through voluntary, entrepreneurial activities that can liberate the exchange process and reclaim the credit commons. While we may not be able to do much in the short-run to change the legal privilege of political currencies or bank-created credit money, we can reduce our dependence upon them. The way to do that is by taking control of our own credit, and organizing independent means for allocating it directly to those individuals and businesses that we trust and wish to support." My personal view is that this should be organized as an open source project, based on free software, administered by a not-for-profit foundation. Just as in those local currency initiatives, credit should be created and destroyed by direct transactions, with a program to keep track of the economic exchanges mediated by the system. The currency should be web based and widely implemented. Some ideas of mine on how to organize that re-capture of the credit commons are posted on the Ning Openmoney site (Harnessing the Credit Commons). On that same site, there is also a very interesting proposal of Martien van Steenbergen on how to arrange dynamic limits of credit and debt. This is what he calls a Trustspace. "The trustspace are the 'credit' and 'debit' limits for safe trade. Of course, if you like risk, you can go beyond someone's trustspace, but you know that you risk losing your extra investment. What does matter in a mutual credit system is the number of times you touched zero when trading (either or not changing sign), since at precisely that moment you have contributed to the community the exact value as the community contributed to you. You are in balance with your environment--that serves you so good and abundantly. Every time you touch zero, your 'trustspace' increases, since you just proved to balance your consumption with your contribution." If you feel a calling to contribute to this discussion, join the openmoney site and jump into the fray. Or find a project you like and volunteer to help. While these kinds of projects are certainly not ready for prime time, they are being worked on. To my mind the future of money will have two major phases. First is what the recent Wired article investigates - Pay Pal and its third party applications as well as mobile money transfer will bring increasing ease and lower cost of transfers of money. This would revolutionize the money moving business, but would still be firmly connected to the field of conventional money. A second step, hopefully not too far in the future, will involve the intelligent use of our own credit as a new means of payment. The details of how this is to be organized are still in the stars, but I believe it is only a question of time until we will see a major shift in how money and exchange are managed.